Resident doctors at Ladoke Akintola University of Technology LAUTECH, Teaching Hospital, Osogbo Thursday joined their voices with those asking governor Aregbesola to resign if he fails to pay their salaries on or before the end on June. 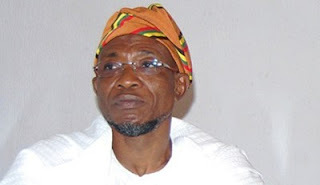 The doctors who staged a protest outside their hospital, stated that Aregbesola’s administration has overstressed their patience over the non payment of their salaries for several months. The president of the association Olalekan Ajayi said “we are here for just a very simple but very complicated issue. We have not been paid for the past eight months. And since then, we have been lobbying and appealing to the government to help but till date we have not been paid. “It has not only affected us as humans, it has affected our families and also our patients. We are telling the government of Ogbeni Rauf Aregbesola to do the needful. “This is economic genocide in our state. It is not compatible with life. For these eight months, we have tried to maintain peace and industrial harmony. There is no official announcement that we are on strike but we can’t work. Dr Ajayi calls the attention of the state governor to the welfare of the state workers and the health sector rather than giving utmost priority to unneeded projects. The advised that contruction roads can wait while salaries are paid and patient would stop dying from inaccessibility to good health care. The association calls on the president to help them by attending to the issue of unpaid salaries. Also speaking one of the doctors Daramola Olusegun Peters appreciated those who deemed it fit to donate food and materials to Osun state government. He said the need to pay salaries is the most important thing at the moment.